Alambik's software suite unleashes your creativity through an incomparable simplicity of approach. Developed from a recent porting of Alambik Script 4 to the Windows operating system, Alambik provides an elegant multicontent solution for professionals and non-professionals alike. Its blend of power and ease-of-use makes it suitable for die-hard content producers as well as creative artists (designers, musicians, etc). Put simply, Alambik combines in one package all the production tools you need for multicontent / rich media development, replacing other, more-limited products with a single, multi-purpose solution. Regardless of what you choose to create with Alambik - be it an independent audiovisual production, a multicontent website, an interactive music video or a 3D animation - we have developed a comprehensive set of FREEWARE viewers that let you deliver the goods to your end-users. 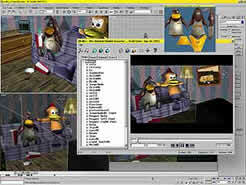 To bring out the magic of true multicontent productions, we offer the freeware Alambik Viewer. Learn more! 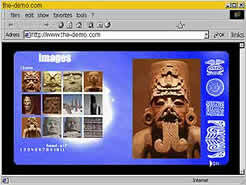 For Alambik multicontent productions displayed in HTML pages, we present the freeware HTML Browser Plug-in. Learn more! Last but not least, for Alamgrams and Hyper-dynamic videos, we have released the freeware Multi-Content Player. Learn more! To streamline the creation of electronic interactive audiovisual productions, we have conceived and developed ALED, the ALambik EDditor. 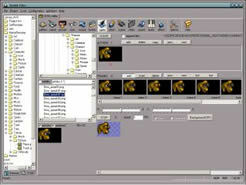 ALED is available in several versions in order to address the needs of all kinds of Alambik scripters. 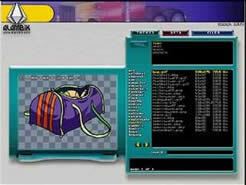 A freeware version for individual users can be downloaded today. Learn more! A Production Assistant for aiding in such tasks as previewing graphic elements, selecting and positioning them on the screen, and selecting RGB true colors. 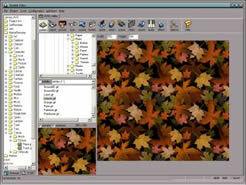 An Audiovisual Object Editor for creating AVOs such as patterns, panels, mouse cursors, buttons, sprites, etc. An Audio Synchronization Tool, which generates ".syn" synchronization files for any music file. 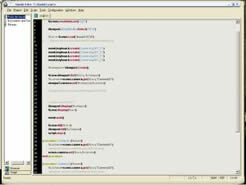 A Database Editor enabling the creation of ".dbf" files compatible with Alambik Script. A Data File Builder which can be used to group files together in order to ease downloading and assure source protection. ALEX, the ALambik EXporter for Discreet 3D Studio Max 3 and 4, allows 3D elements produced in 3ds Max to be previewed, exported, and converted to function in the Alambik environment. Export meshes, materials, cameras, and lights directly over to Alambik. Export any kind of animation. Export hierarchical relations between meshes, cameras, and lights. Use skeletal animation within the Alambik environment by importing bone and skin definitions. ALEX is available in several versions in order to address the needs of all kinds of Alambik scripters. A freeware version for individual users will soon be available. Learn more! 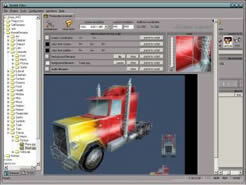 Additional exporters are currently being developed for Maya and SoftImage Learn more! To round out Alambik's software suite, we have conceived and developed a wide range of Audiovisual Object Libraries. The first AVO library to be released includes over 3 600 AVOs, fully categorized and optimized to enhance your Alambik scripts quickly and easily. This library comes in standard and professional (full source code) versions. Learn more!